Red Deer County council today unanimously agreed to purchase the former Alberta Central Railway Mintlaw trestle west of Springbrook from Canadian Pacific Railway for $1 in exchange for a tax receipt for $8.8 million, determined to be the current value of the structure. The bridge across the Red Deer River has been identified as a heritage site and an important landmark in the county. It was built in 1911-1912, leased to Canadian Pacific in 1913, acquired by CPR in 1957 with the last train crossing it in 1981. At 2,112 ft., it is the second longest CPR steel trestle bridge in the province. In the future, the County will determine if the bridge is suitable for recreation use as a pedestrian bridge. The 2010 budget allows for the acquisition of right-of-way on each side of the 32-span structure. Earlier in the year, the County, in the Open Spaces Master Plan, had identified the former Alberta Central Railway right-of-way between Red Deer and Benalto as a future recreational and agri-tourism trail. The federal government is providing bridge financing for a bridge in Ponoka. Wetaskiwin MP Blaine Calkins announced Oct. 14 that the Town of Ponoka will receive federal funding to construct a pedestrian bridge over the Battle River. "This investment I'm very excited about because it will improve the quality of life right here in Ponoka," he said. "This bridge will make the experience of visiting the river valley all the more attractive and enhance people's experience." The new 140-foot long bridge will come off the new 57th Avenue train crossing. The pedestrian bridge project is funded to a total of $500,000: $185,000 from National Trails Coalition; $86,000 from Trans Canada Trail; $100,000 from Alberta TrailNet; with the balance to be paid by the Town of Ponoka. "The Government of Canada is providing $185,000 to develop this bridge that will improve safety and link the trails on both sides of the river," said Calkins. "As part of Canada's Economic Action Plan, we are boosting local economies by creating jobs and enhancing trails for outdoor enthusiasts." "Now with this money, it makes the project viable," said deputy mayor John Jacobs. "It's something we can proceed with. This is great news for us." Jacobs said the trails through Ponoka's river valley are part of the TransCanada Trail system. Funding for a footbridge over the Blindman River was also announced Oct. 14. That will help create a trail linking Penhold to Ponoka. This project is supported through the Government of Canada's $25 million investment in recreational trails, part of the Economic Action Plan. The government's investment is matched by the NTC and provincial, territorial, municipal and private funding partners. Calkins said Prime Minister Stephen Harper was awarded the highest honour granted by the Canadian Council of Snowmobile Organizations (CCSO) for delivering on his commitment to expand Canada's network of national trails through the Economic Action Plan. Will's Welding is constructing the bridge in its Ponoka shop. Will Dillen told the group at the announcement at the the town hall that the main centre section of the structure has been built and the piles are in the ground at the site along the river. "There should be no problem meeting the March 31 deadline," he said. Dillen said the infrastructure program has had the intended effect of keeping Albertans working. With the slow economy, he considered laying off staff. "Because we knew it (bridge project) we were able to keep the staff on," Dillen said. "Some of the guys breathed a sigh of relief because they thought they would be getting pink slips and they didn't." A seasoned marathoner is on the run to improve trails around six Lacombe lakes and ponds. Lacombe resident Bill Nielsen helped organize Sunday's first annual Lacombe in Motion Walk/Run involving more than 200 participants. He said the community event's proceeds will go towards developing new trails, improving existing ones, setting up outdoor workout stations along several main trails, along with other possible improvements. Final fundraising tally wasn't known on Sunday. Trail development is important to people's well-being, Nielsen added. "People can get exercise either running, walking or biking on these trails," said Nielsen, 69. "You have a sense of going back to nature." Nielsen is a longtime fitness advocate, completing his 100th marathon in 2008 at the age of 67. Over the last 12 years, he carved out 15 km of trails using a grub hoe and other tools. The paths exist around Elizabeth Lake, Little Barnett Lake, Barnett Lake, Lake Anne, Henner's Pond and Cranna Lake. Some trails are made with wood chips, while others are asphalt and dirt. "We can make the trails around Henner's Pond wider, we can put wood chips down on the dirt trails and maybe extend the trails," Nielsen said. Nielsen said the trails could extend north as the town expands and additional ones could be built on the CUC campus. New ones could also connect with the Trans Canada Trail network to the south, where trails are being built from Penhold to Blackfalds, Lacombe and Ponoka. 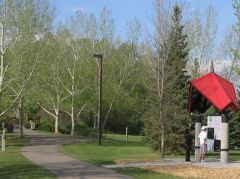 Both the Town of Lacombe and Canadian University College help maintain the trails developed by Nielsen. During the Woody's RV World Marathon and Half Marathon banquet this year, world-class ultramarathoner Scott Jurek raved about the trails, while on a run with Nielsen. "The trails around Cranna Lake are well used, but the rest aren't," said Nielsen. "So this is why we wanted to hold this race -- we want to draw awareness to the trails." The run began and finished at the college campus. Participants took a two-km, five-km, 10-km and 21-km distance route. The college's running club, in partnership with community members, planned the race in co-operation with the municipality. The Town of Ponoka has received a federal grant of $185,000 to build a pedestrian bridge over the Battle River on its portion of the Trans Canada Trail. To be administered by the National Trails Coalition, the grant dovetails with an announcement on Tuesday that Lacombe County would receive $50,000 to build a pedestrian bridge where the original C&E Trail crosses the Blindman River, south of Blackfalds. Both projects fall within the Central Alberta Regional Trail Society's intention to create 70.6 km of trail through Red Deer, Lacombe and Ponoka Counties, including 5.2 km of trail within the Town of Ponoka. Wetaskiwin MP Blaine Calkins announced Ponoka's share of the funding at the town office on Wednesday afternoon. The federal government, under its economic recovery program, has set aside $25 million to build recreational trails. Please visit www.tctrail.ca to learn more about the Trans Canada Trail network. Army engineers and an injection of cash from the federal government will help kick-start the Lacombe County leg of the Trans Canada Trail. Wetaskiwin MP Blaine Calkins announced Tuesday that the federal government will provide $50,000 toward building a pedestrian bridge at the southern boundary of Lacombe County where the C&E Trail meets the Blindman River. The new bridge will go in the spot where a traffic bridge was torn out a number of years ago, said Phil Lodermeier, operations manager for the county. His department is seeking $225,000 from the county's 2010 budget for the first phase of the trail, taking it from the Blindman River to the Town of Blackfalds. Alberta TrailNet has contributed $100,000 toward the project and Trans Canada Trail has provided $51,040. Lacombe County committed $50,000 earlier this year for building materials. While county workers will lay the bridge foundation this winter, members of the Corps of Engineers will build the bridge deck and install the handrails in spring, said Lodermeier. "They quite willingly volunteered. I guess they do this on occasion and it's good practice for them," he said. The bridge deck will be about 2.5 metres wide, just narrow enough to discourage people from trying to drive quads or trucks across. A second phase will take the trail to Lacombe and then there will be two more phases from Lacombe to Morningside, where the trail will meet the Ponoka County leg, said Lodermeier. "The Trans Canada Trail will eventually stretch from Penhold to Ponoka." Lodermeier anticipates that Lacombe County's share of the project will take roughly four years to complete. Calkins was to announce similar funding today for the Ponoka County leg of the trail, which will include a pedestrian bridge over the Battle River. Funding for the trail projects comes from a total of $25 million for recreational trails provided under the Conservative government's Economic Action Plan. Funds for the projects are being administered by the National Trails Coalition. Red Deer County has started construction of a trail system in the treed and meadow natural area south of the hamlet of Springbrook and Airport Drive. The main spine of the trails is part of the Trans Canada Trail system with branch trails emanating from it and will connect with the town of Penhold along Range Road 281. Residents of the area have been looking forward to the trail for several years. The county purchased the natural area a few years ago when it was in the running for the provincial police college. Some trails are expected to be paved and a lookout is expected to be constructed near the wetland. Funding for the trails has come from a variety of sources including the Trans Canada Trail Foundation and Alberta TrailNet. (bouquet) to the troops of the Canadian Forces who are mobilizing in Central Alberta to help blaze the way for a portion of the Trans-Canada Trail. This trail is of immense importance to all Canadians, and a boon to the tourist industry, by offering first-hand a rare glimpse of the 'innards' of Canada. Its easily hiked trails will lead young and old through the heart and soul of this great country's flora and fauna. It's vital that all provinces, municipalities and citizens -- be they rural or urban dwellers -- welcome this exciting venture. In this area, the military will be deploying troops to help build a pedestrian bridge in Lacombe County. Army engineers will donate their time and expertise (worth about $50,000) for the $300,000 bridge over the Blindman River, which is part of the walking trail project. With the funding in place, the bridge is expected to be completed by the spring. The county is looking at a link from the Town of Blackfalds to the pedestrian bridge. Later, the trail will extended to create a link with the Town of Lacombe. "It's good to see it (the bridge project) is going to be a go," said Phil Lodermeier, Lacombe county's manager of operations. And still on the walking trails, a dart to those opposing this exciting venture. In particular, some members of the rural community who argue that they don't want city folk invading their properties. For the most part, the trail plan will be accessing properties not in the hands of private owners -- abandoned rail lines, for example -- which offer great potential for trails. The problem is, those abandoned lines also wind through the rural areas that some farmers seem to think are off limits to the public. For years, they have been using those rail lines as convenient crossing points to get from one field to another. They don't want that luxury disturbed. Red Deer County has cautioned that "public support" is essential before any trails are blazed through its turf. County Deputy Mayor George Gehrke praised plans for trail systems, but cautioned that landowners must have the final say. That's not being disputed. "People who live on the land don't need a trail, they've got a trail going out their front door," said Gehrke. "People in the neighbourhood are not in favour of urbans stomping through their yard, and they don't want to pay for it." But "urbans" using those trails will not be stomping. They will be walking with respect and care. Common sense should tell Gerhke those trails will not wind through anybody's yard. And those concerned about who will pay for these trails should not lose sight of the fact that, for the most part, it's the urbanites' tax dollars that prop up the agricultural community when it faces tough times. Now that funding is in place the county can go ahead and tender the project, said Phil Lodermeier, the county's manager of operations. The project will likely go out to tender and construction could start later this year. The bridge is expected to be completed by the spring. "It is good to see it is going to be a go," Lodermeier told council Thursday. The Rocky Mountain House to Nordegg trail is expected to cost $6.8 million to complete. The three-metre wide trail, much of which will be along the old rail line, will have washrooms, garbage cans, picnic sites, signage and a few remote campsites. Mike Haugen, community and protective services manager for Clearwater County, said on Friday the next step will be to explore possible partnerships with provincial agencies, industry and volunteer groups to fund the project. The county will also need to get various approvals from Alberta Environment, Alberta Fish and Wildlife and possibly even the federal Department of Fisheries and Oceans, with around 60 stream crossings along the trail. Haugen said they will still need to isolate the exact route for the trail as well. Staging areas, where people can park their vehicles, horse or ATV trailers , are planned for Prentice Creek, Chambers Creek, Jackfish Lake, Saunders, Harlech and along the Forestry Trunk Road. The staging sites aren't for camping, but for day-use for parking vehicles while people use the trail. The trail will be open to both motorized and non-motorized traffic. A name hasn't yet been decided, but some of the possibilities suggested have been Martin Nordegg Trail, Coal Miners' Trail, North Saskatchewan Valley Trail and Clearwater Heritage Trail. There is a Facebook page for the project called Rocky to Nordegg Trail. Adding new paths in a west-end neighbourhood and at a new off-leash dog park are part of this year's trail enhancements for Red Deer. 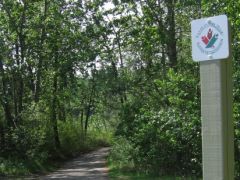 The City of Red Deer is working on various sections of the pathway system, including building three km of natural trails, boardwalks and viewpoints with Maskepetoon Park natural area bordering the Oriole Park neighbourhood. By doing these trails, the city hopes that people won't make paths of their own. "It builds a purposeful route through the forest," said parks superintendent Trevor Poth. And three to five-km trails will be developed for a new dog park east of Westerner Park and south of 19th Street. The park will be fenced and will include gravel trails, various shrubs, pet agility features and site furniture. Poth anticipates construction on the park will begin in August with completion by the end of September. A total of 800 metres of asphalt trails will be built within the civic yards parcel but outside the fence line so that the public can access them. When this project is finished, a three-metre wide sidewalk will be running on the west side of the civic yards found in Riverside Heavy Industrial Park. Poth said the sidewalk is part of a project to widen 40th Avenue in the area. Some trails through the city will also be upgraded or repaired. Some paths are severely cracked so they need new asphalt down. One area that will see repaving done is immediately next to the Red Deer River, from the Lions Campground north to the Three Mile Bend off-leash dog area. That involves a stretch of 1.3 km, the biggest trail overlay project for the city this year, Poth said. It will be temporarily closed until Sunday while work is underway. About 500 metres of North Bank trail adjacent to Riverside Drive will also be closed off until Sunday while asphalt is replaced. The trail north towards Three Mile Bend will also close temporarily. Crews will also repave this week about one km of trail by Oriole Park School, from the intersection of Taylor Drive and Oleander Drive south to Kerry Wood Drive and Fountain Drive. That trail will remain closed until Sunday. A total of $400,000 in sidewalk improvements will be done this year. Two new bridges are expected to be built this year for trails crossing the Blindman River and the Battle River. The Central Alberta Regional Trail Society has been working on the project with Lacombe County, the Town of Ponoka and other municipalities in Central Alberta and has just about collected enough money to move forward with the projects. Town of Ponoka Councillor John Jacobs said the Ponoka project has collected $200,000 from Alberta TrailNet to be used for the bridge and trail from Ponoka to Lacombe. Another $85,000 for the bridge and $66,280 for the trail will come from the Trans Canada Trail Foundation, $52,000 has been collected in donations from citizens and $102,000 has been put in reserve by the Town of Ponoka for the project. Jacobs, who is also a director of the Central Alberta Regional Trails Society and a director of Alberta TrailNet, said they will put an application in soon for another $200,000 under the National Trails Coalition/Federal Trail grant program, which they hope to find out about by mid-July. He said whether or not they get the money, they will proceed with the project, but it will determine the level of construction and whether or not the full project will be completed this year or if things like signage will be done as money becomes available. "First of all, it is vital for two reasons -- on a local level because it obviously gives us more access to our trail system and it is vital to the Trans Canada Trail system," Jacobs said. The work on the Ponoka bridge will be done by Will's Welding, with the decking for the bridge anticipated to be completed by the Canadian military engineers. The project could start as soon as July, with the bridge being completed by the fall. The bridge crossing the Blindman River is expected to cost $250,000 to $300,000, with work starting in the winter. A tender is being prepared for the construction of the bridge, with Canadian military engineers coming later to do the bridge decking. Phil Lodermeier, manager of operations with Lacombe County, said Alberta TrailNet has given $100,000, the National Trails Coalition has given $50,000, the Trans Canada Trail Foundation has put $20,000 to the design and engineering and has committed $50,000 for the construction of the bridge, Lacombe County will donate up to $50,000 worth of bridge materials. He said the county will soon apply for $1 million for a Recreation Infrastructure Canada grant through Western Economic Diversification Canada for money to work on the trail. The trail will be for bicycles or pedestrians. It will run parallel to Hwy 2 from the Blindman River to Morningside and cost around $2 million. He said if the grant doesn't go through, it will be a matter of doing it piece by piece. "I think it's a really exciting time for trails people. It think it would be a great addition to Lacombe County, as far as quality of life for our residents," Lodermeier said. "So hopefully we can make it happen." Raising money for the trail systems in Central Alberta is as simple as slipping into your hiking boots, sneakers or sandals, taking a photo and sending it to the Central Alberta Regional Trails Society. The society is collecting photographs via e-mail to send into Keen Canada. For every photo of feet clad in shoes on a trail, the Canadian outdoor outfitter will donate $5 to develop trails in Canada. "It's just a small way that you can make a difference," said Debbie Olsen, president of the Central Alberta Regional Trails Society. CARTS is a not-for-profit society that has provided information and support on recreational trail development locally for close to a decade. Olsen said a family of four taking a picture and sending it in would raise $20. "If they enjoy the trails then why not do this small thing to give back?" She is hoping people at many of the walkathons along the local trails this summer will consider taking photos of their feet and sending them in so they can help two causes at once. There are up to 10 people allowed in each photograph. If a group of 100 walkers sent in 10 groups of 10 it would mean $500 in funding. Keen Canada will send the money that is raised in Alberta TrailNet. Olsen is hoping if they keep track of the number of local feet photos going in that they will reap the full benefits of the funding. Hikers and walkers can send their pictures to info@centralalbertatrails.org until October 31. CARTS got started with the project Saturday during its Trails Day and annual general meeting held at the Kerry Wood Nature Centre. Olsen said they collected around 15 pictures of feet. Keen Canada will give up to $75,000 towards the project across Canada. The money can be used for trail construction or stewardship, as well as volunteer programs. Central Albertans are invited to come out to Trails Day at Kerry Wood Nature Centre on June 13, from 10 am to 12:30 pm. Sponsored by Central Alberta Regional Trails Society, the event will kick off at 10:15 am with a Leave No Trace workshop where people can learn how they can keep natural areas and trails prestine. A presentation by Medicine River Wildlife Centre will run from 11:15 am to 12 pm. Photos for Boots Across Canada campaign to raise money for conservation happens from 12 to 12:15 pm. Light refreshments will be served from 12:15 to 12:45 pm followed by a presentation on CARTS and trail activity in Central Alberta, and CARTS annual general meeting. Admission is free. Red Deer city council recently passed a resolution urging the province to consider trail construction as part of the building or rebuilding of roads and highways. The resolution will go to the AUMA (Alberta Urban Municipalities Association) convention this fall to vote on as an association resolution to the province. Several other Central Alberta municipalities have passed a similar resolution, including Lacombe, Ponoka, Penhold, Sylvan Lake and Blackfalds. The resolution recommends a change in policy to provide for alternative modes of transportation such as cycling, running and walking along or across highways as a means of connecting communities during the design process. Currently, Alberta Transportation policy only provides for the movement of vehicles in highway right-of-ways with very rare exceptions. (bouquet) to the County of Red Deer, for making trail development through the county a priority. Trails connecting Springbrook to Penhold and Spruce View to Dickson, and a Cottonwood day-use area near Dickson Dam, have been touted as the first step towards turning Red Deer County into an outdoorsman's paradise. But actually, it's more than that -- it's also a way to connect city dwellers to area towns, and tourists with businesses willing to provide services. "Most of the county is very beautiful," said Bev Sandalack, an environmental design professor who helped work on the plan. She's very right, and the best method to keep it that way is to make the special places in our countryside available for wide appreciation. Next, what's needed is co-operation and assistance from the city and its many trail users, to link city trails to the county's network at as many places as possible. Red Deer County hopes several recreational pilot projects will help them move forward with its Open Spaces Master Plan. "As we go through the implementation of those projects, we will learn the process and carry that knowledge forward," said Alex Taylor, a planner from Dillon Consulting. Taylor described an intricate network of trails and outdoor recreational areas that could come to fruition under the plan at a Tuesday council meeting. At the same time, they warned council that it's necessary to take action and gain public support in order to implement the plan. "It's great to have a plan but we don't want it to end up as a report on a shelf," he said. The goal is to create a variety of open spaces throughout the county to take advantage of the scenery and existing landmarks of different areas, which would be connected by trails wherever possible. Taylor identified seven distinct zones within the county that could benefit from developing trail systems and recreational areas, including Alberta Central Railway, Medicine River, Ghost Pine and Boomtown. "Most of the landscape in the county is very beautiful. We want to work with existing features such as the trestle bridge," said Bev Sandalack, an environmental design professor who helped work on the plan. Several councillors expressed their enthusiasm for the plan and lamented the lack of trails in rural Alberta. "What seems like an anomaly to me is the lack of trails in a rural environment, compared to Europe and other areas," said Councillor Reimar Poth. Poth said the county is leading the province in terms of promoting a trail network, but acknowledged the difficulty lies in getting the public on board. "This is a very long-term project. Only with public support and funding will it ever get done," he said. Deputy mayor George Gehrke praised the plan and its goals, but argued landowners should approve of any changes to their property. "People who live on the land don't need a trail, they've got a trail going out their front door . . . People in the neighbourhood are not in favour of 'urbans' stomping through their yard, and they don't want to pay for it," he said. Planners began consultations for the plan in 2005. Another series of consultations and work on precise implementation strategies will be completed before it returns to council for approval. Red Deer County council got their first look at the Open Spaces Master Plan at yesterday's meeting. Officials from Dillon Consulting were on hand to present the report to council, which they've been working on since 2005. The Open Spaces Master Plan, which plans 20 to 30 years ahead, shows where potential trails and parks could be located throughout the County. "A lot of the areas we identified for potential parks and trails are near some of these towns and hamlets throughout the County where people live," said Alex Taylor, planner for Dillon Consulting. "It could be trails linking communities together, recreation features and tourist places as well." Short term projects within the Open Spaces Master Plan include a trail located between Springbrook and Penhold as well as between Spruce View and Dickson. Another short term project that was identified in the plan is the construction of a day use area in Cottonwood. Councillor Jim Lougheed said the plan should have been developed long ago. "It's unfortunate we didn't start the plan 50 years ago because we might have had things in place by now," he said. Council is expected to adopt the Open Spaces Master Plan at a meeting next month.